Seriously Seedy Spelt bread in 10 mins! Happy Monday all! This weekend has been a big cooking weekend so another recipe to start the week! Before I start just wanted to let you know that have a couple of awesome workouts which I will be uploading over couple of weeks. So watch this space! 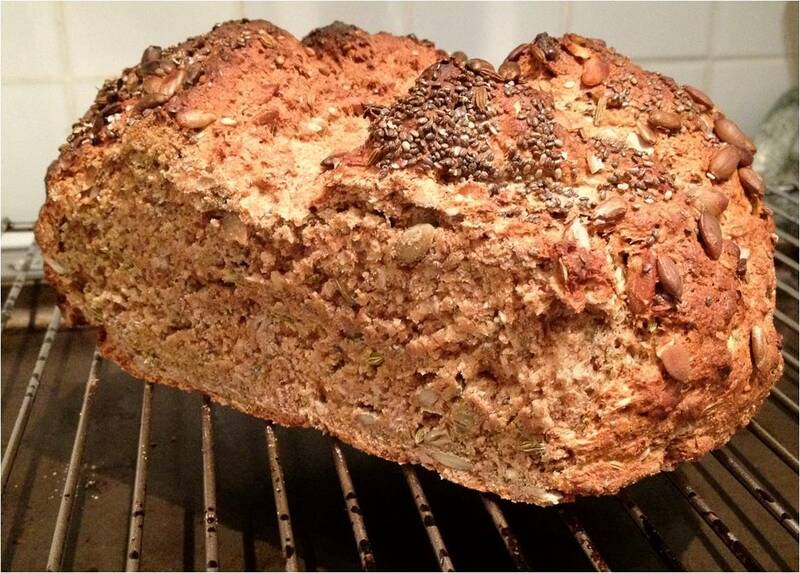 Anyway, for today’s post I have the most delicious, quick and easy spelt soda bread recipe to share with you. It literally takes 10 minutes to prepare (if that!) and only 35 minutes to cook. I was utterly shocked that making bread could be this easy! It tastes awesome and my version is 100% spelt and seeds, no white wheat flour whatsoever meaning that it wont send your blood sugar levels soaring. Incase you are not familiar with the Spelt grain it is an ancient variety of wheat that has a higher protein content and also higher B vitamins, potassium and iron content than other types of wheat. Bread made with this flour plus the addition of seeds has a lower GI than most other types of bread. If you can’t find spelt you could always substitute for stone-ground wholemeal flour instead and if you can’t find the seeds I used below you can always experiement with different varieties. Pre-heat your oven to 200 c. Sift the flour, baking soda and salt into a bowl and mix together. Add in most of the seeds (leave around 2 tablespoons). Make a well in the middle of the mixture and pour in the buttermilk. Stir the dough until it just comes together, if it is a little too dry then add a splash more buttermilk. Tip the dough onto a lightly floured board and knead for about a minute or until the mixture comes together in loose ball. Don’t knead for too long. Working quickly place the ball onto a lightly floured baking sheet and cut a deep cross in the top (around 2/3 of the way through). Brush with buttermilk and sprinkle with the remaining seeds. Bake for around 35 minutes on the middle shelf, it the top doesn’t have enough colour then move up a shelf for the last 10 minutes. Cool on a wire rack. Can you relate to this? You get back from work late and realise that yet again you have forgotten to take the evenings dinner out of the freezer! What to do? You don’t want to waste money on an expensive greasy takeaway but you don’t exactly feel inspired to pop out to the shops to create a last minute gourmet meal either. This is where this quick and easy little dish from Bill Granger works wonders! Created from left overs that are lying around in the fridge, it literally takes almost no time to cook. It’s packed full of protein and veges and is relatively light, especially if you are eating later than you would like. Heat the grill to its highest setting. Place a 9 inch frying pan (with a heatproof handle) over a medium to high heat. Add the olive oil, leek, salt and pepper and cook for 5 minutes stirring continuously. Add the broccoli and zucchini and cook for another 5 minutes. Sprinkle with the herbs and pour the eggs over the top. Crumble the feta over the omelette and cook for 5 minutes. Finish under the grill for another approx 5 minutes or until golden and bubbling. And there you have it…Too easy!! An old favourite that tastes of goodness! This weeks post is an extremely simple and easy old favourite that I am sure most of you know how to cook already. Anyway, the recipe I am talking about is Ratatouille which is basically a tomato and aubergine (sorry egg plant for you aussies!) based dish. It is great as both a main meal feature – in addition to sufficient portion of protein of course and also an accompaniment to a main dish. I tend make more of a feature of it, usually crumbling feta cheese on the top…along with my usual concoction of pumpkin, sunflower and chia seeds. I also like to stir in a can of tuna for extra protein. 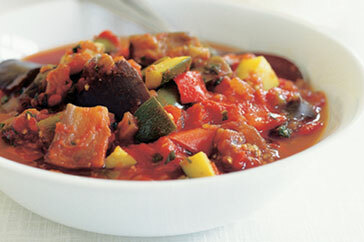 Anyway enough of my garbling… I am sure there are a million recipes out there for Ratatouille but this is mine! Fry the onions in a little olive oil for a couple of minutes, then add the peppers, courgette and celery and sun-dried tomatoes. After about 4-5 mins add the aubergine (that has been blanched in hot water) and after a couple of minutes again the cans of tomatoes, herbs and seasoning. Simmer gently for around 20 -30 mins and serve. Around 4-6 – My hubby and I got two lunches each and an evening meal accompaniment out of it. We find it’s actually better the next day! I know it might sound totally INSANE but my life changed quite considerably recently, thanks to a slow cooker! For those of you who already have a slow cooker you will probably know what I mean and for those of you who don’t, hear me out, you seriously have to get one! Imagine arriving home from work tired and hungry after a long day. You open the front door and it hits you… the whole house is filled with a wonderful aroma of hearty, warming, home cooked food. Food that nourishes the body and gives it energy, food that takes you back to your childhood days and those wonderful Sunday lunches that were prepared for you and not by you. Aside from the tastiness and convenience aspect of this wonderful little pot, there are many other benefits to this form of cooking too. Due to the fact that the ingredients are being cooked at a slow temperature for a long time they become extremely tender and juicy and as there is little evaporation they won’t dry out. Also very importantly the natural juices from the meat and vegetables are retained in the slow cooking pot meaning that the cooked food is extremely nutritious too. The slow cooker is also very inexpensive too, I think ours was around $40 and no mounds of washing up afterwards as all you have to wash up is one pot! Anyway, enough of my rambling, it’s time to put words into action! Here are a few great recipes to try using the slow cooker. Put all of the ingredients except for the capsicum into the slow cooker. Cook on low for 4.5 hours, until beef is tender and butternut squash is cooked through. Stir in the capsicum and then turn the cooker up to high and cook for a further 1 hour with the lid off. Season with salt and pepper and stir in the yoghurt before serving. Put all of the ingredients (except the basil, parsley and lemon) into the slow cooker. Rinse the preserved lemon well, remove and discard the pulp and membrane and finely dice the rind. Add to the chicken and cook on low for 8 hours or until chicken is cooked through. Stir in the basil and serve with sprinkled chopped parsley. Rinse lentils under cold water until water runs clear; drain. Heat oil in large frying pan; cook onion, garlic and ginger, stirring, until onion softens. Add spices and chilli; cook, stirring, until fragrant. Add stock; bring to the boil. Pour stock mixture into 4.5 litre slow cooker; stir in chicken, undrained tomatoes, pumpkin and lentils. Cook covered on low for 7 hours. Stir in coconut milk; cook, covered on high, 15 minutes, stirring once. Stir in spinach and coriander. Season to taste. Top with plain yoghurt. Don’t we all have those lazy TV dinner moments when all we want is a film and some good old comfort food?! Rob and I had one of those moments last sunday evening. We had taken the dog out for a run and it had started to tip down with rain half way round. By the time we got home we were drenched and were craving something warming and comforting but also healthy, nutritious and guilt free! In other words a food that would make us feel good! After a moments deliberation we turned to good old Delia, in my view the queen of comfort eating! 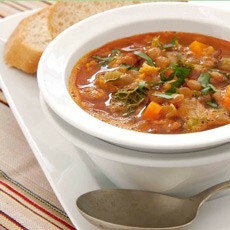 We came across this awesome recipe for Lentil Soup from ‘Delia’s Complete Cookery Course’. It is extremely easy to make and a great way to use up those left overs in fridge. The recipe includes lentils which are packed full of filling, muscle building protein plus they are full of fiber and have significant amounts of folate, iron (for energy) and magnesium (which helps keep your heart healthy). The soup is so yummy and really is a meal on its own, it honestly keeps you feeling full for HOURS afterwards! Heat the oil in a large cooking pot and fry the bacon in it until the fat begins to run. Then stir in the prepared carrots, onion and celery and, with the heat fairly high, toss them around to brown them a little at the edges. Now stir in the washed, drained lentils plus the contents of the tin of tomatoes followed by the crushed garlic then the stock. Please note: I made a few minor changes to the original version. I used organic bouillon vegetable stock instead of homemade for speed. I also used back bacon instead of streaky and a few extra slices to increase the protein content. Hi guys, I am still here! Apologies for my lack of posts recently but the weeks seem to have flown past, all excuses I know but you know how it gets! 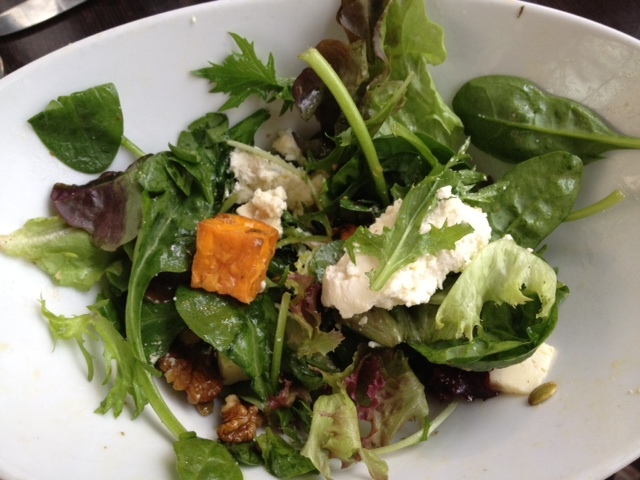 Anyway, I wanted to share a fabulous salad that I had on Saturday at a cafe in Paddo. This salad was SERIOUSLY good, so good in fact that I had to take a photo of it and then then raved on about it for hours and hours afterwards saying it was the best salad I had ever had! As you know I am a strong advocate of high protein, low GI eating for sustained energy and to keep you feeling fuller for longer. In other words eating in such a way that you avoid sugar spikes that are followed by subsequent dips that can lead to sluggishness and weight gain. Enjoy! The combination of the curry powder and the feta are honestly to die for! 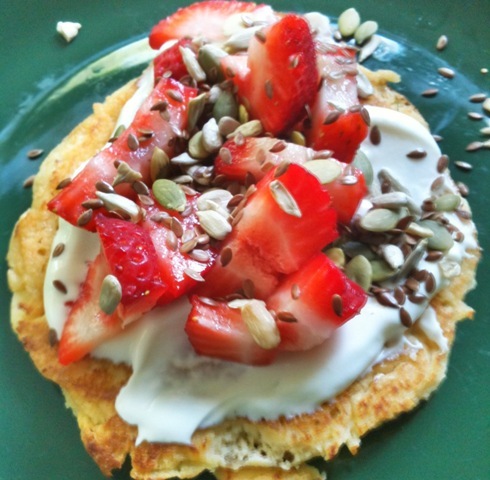 THE BEST Pancakes Ever… plus they are Healthy! In my opinion (and singer Jack Johnson’s) there is nothing more scrumptious than freshly made pancakes on a Sunday morning!! Just thinking about the smell of them right now makes me salivate! We discovered this recipe for high protein pancakes a few months ago and we just can’t get enough of them! They are gluten-free, very high in protein so they keep you feeling satisfied for hours afterwards and so yummy they beat the unhealthy white refined kind hands down. To make then extra nutritious we serve them with natural yogurt mixed with a touch of vanilla, some fresh strawberries and a good sprinkling of pumpkin, flax, sunflower and chia seeds. Give them a try and let me know what you think! Just so you know they aren’t the wafer thin crepe style variety but the puffier scotch pancakes. Mix all the ingredients together in a bowl and cook in a little oil like regular pancakes. Serve with natural yogurt with a few vanilla pods, fresh strawberries and a sprinkling of seeds – we like pumpkin, sunflower, flax and chia. There is nothing I love more than a few nibbles and a really great dip! The problem is that all too often they are high in salt, sugar and full of chemicals and other cr*p. I came across this recipe a couple of months ago and although it is extremely healthy, it is very tasty indeed! The yogurt (especially Total brand) is an excellent protein source. The avocado is high in cholesterol lowering monounsaturated fats, vitamins B, E and K and is high in fiber. For those watching their budgets this dip is also very cheap to make! 1 cup Greek yogurt (such as Total) You could also use low fat but I tend to avoid using low fat as often means more sugar! Very simple! Put avocado, yogurt, lemon juice, vinegar, 1/3 cup chives, parsley, and salt to taste in a small food processor or blender and puree until creamy. Stir in the remaining chives, reserving some to garnish the dip. Serve with assorted fresh vegetables such as raw or lightly steamed carrots, broccoli, peppers, snow peas etc. For those of you who live in Singapore like us you will appreciate just how expensive Hommus can be to buy in the shops! After 2 years of spending what is probably hundreds of pounds on Hommus we finally decided that enough was enough and that we needed to start making our own! We also realised that a lot of the Hommus you can buy, however tasty, has a least one unknown chemical ingredient on the label or it is full of added salt, sugar etc. We found this recipe and I have to say it is so easy, quick, inexpensive and very tasty! You literally just put all the ingredients in a blender and there you are! 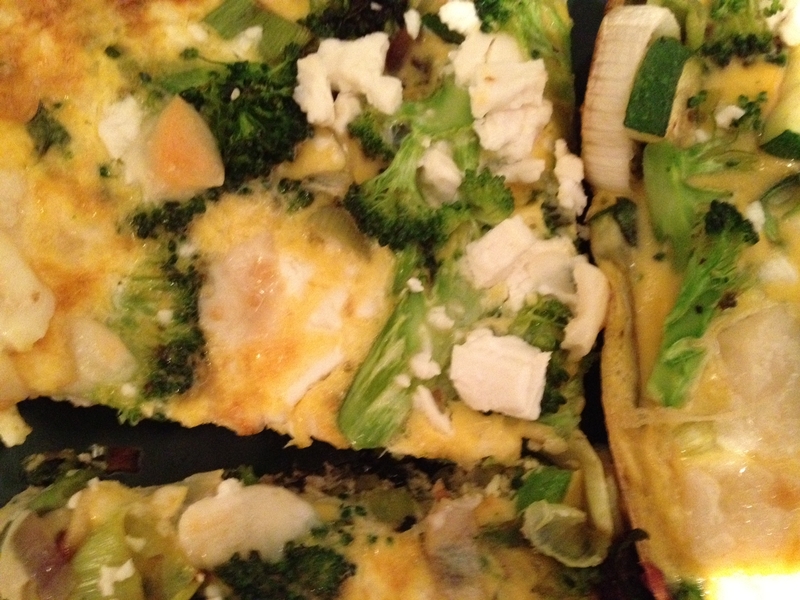 I was given this recipe by a dietitian in the UK and I have to say they are REALLY tasty! It is actually very hard to believe how healthy they really are and they literally take a couple of minutes to prepare and 15 mins to cook. They are very high in protein because the recipe uses almonds rather than flour. This helps to keep the blood sugar levels in check and keeps you feeling fuller for longer! Whisk the ingredients together and then put in a greased 12-muffin tin and bake for around 15 mins at 180 celsius.